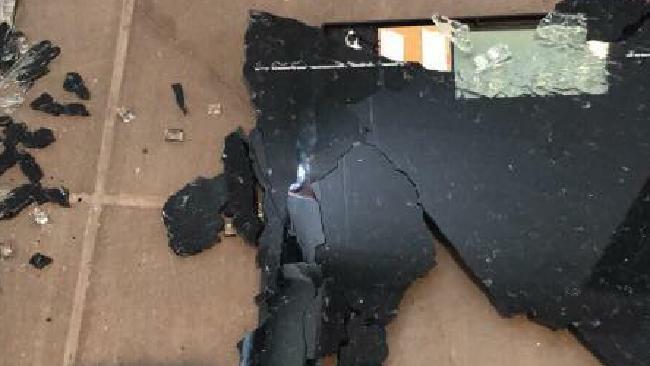 A disgruntled Facebook user has posted a warning about how her $15 set of Kmart scales shattered with a light nudge. 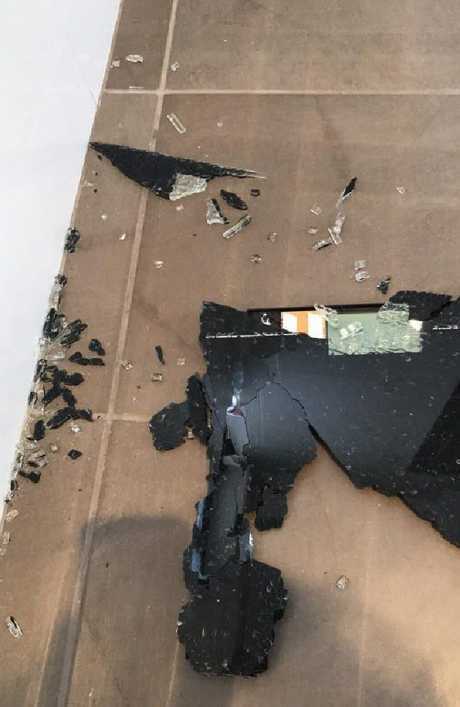 A WOMAN has revealed on Facebook how a set of $15 Kmart scales exploded, sending pieces of glass flying across her bathroom floor. Louise - who asked not to be identified - posted about her experience to the Kmart Mums Australia Facebook page, alleging that she "lightly nudged" the product before it exploded in to pieces. "Glass went everywhere," she wrote alongside the image of the shattered scales. "As I was cleaning up, the shards shattered into smaller and smaller pieces. Kmart has been notified." 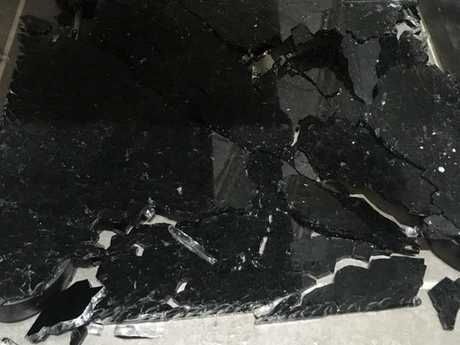 Louise, from Western Australia, told news.com.au that she was forced to pick up the pieces of glass by hand, but luckily avoided injuring herself during the process. "I didn't cut myself," she said. "My husband and I picked it up by hand, and then vacuumed it twice. A Facebook user posted an image of her shattered scales to a Kmart Facebook group. "It [glass] went pretty far and was definitely sharp. Thankfully my son wasn't too close. I understand that tempered glass is temperature sensitive (they told me this on the phone) if it's that sensitive, it should be recalled. Bathrooms are subject to a lot of temperature fluctuation so it was surprising." Her post, which was met with more than 200 likes within an hour of uploading, had other users reveal their similar experiences with the product. "Same thing happen to me and you could still here (sic) them [glass pieces] crackling after," one user posted. "Same thing happened to mine. So glad my kids weren't in the bathroom at the time," another added. "I've seen so many posts about these scales exploding," another user said. "Surprised Kmart still hasn't done anything about them." News.com.au has contacted Kmart for comment and is waiting for a response. Another woman posted an image of her shattered scales. 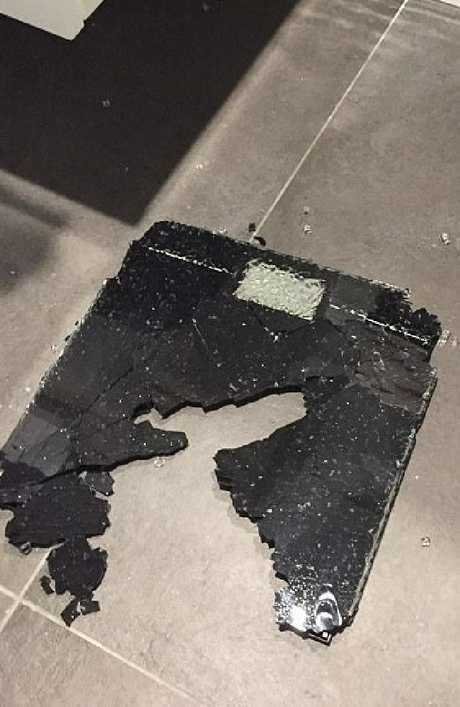 Last year, a Sydney man said his set of scales exploded "out of nowhere" when he picked them up to clean his bathroom floor. Jean Franco Vilaro said he "was in a panic" and that "there was glass all over" his floor and carpet, as well as near his toilet. Speaking to the Daily Mail at the time, Mr Vilaro said he scooped up the glass and put it aside to show the discount department store. "Thankfully I wasn't injured but imagine having children around," he said. Sydney man Jean Franco Vilaro said his $15 Kmart scales exploded in 2017. "I think it is important people know how dangerous this could be, as it was a major fault." According to Kmart's website, the digital bathroom scale has a large LCD screen that automatically switches on or off and is battery operated. "The ultra-slim body features a black glass surface" and has the ability to hold a maximum load capacity of 150kg. Earlier this year, the discount department store issued an urgent safety warning to consumers who used two of its single burner stoves. In March, the company recalled Active & Co. and Jackaroo portable single burner stoves purchased between November 2015-May 2017 "due to an issue with the manufacturing". The notice advised consumers that there had been "instances where gas leakage" occurred during operation and warned that "fire or explosion" was a possibility. What happened to $30 Kmart favourite?